Why Should You Use Advertising Flag As A Medium of Brand Promotion? The one thing that makes an advertising medium a good one, is its capability to draw attention, and this is exactly where advertising flags score high. The waving banners actually do create quite an impression on your prospective buyers. It feels like a hand signal, calling at people, trying to draw their attention. You can display an advertising flag down the street or around the corner of your outlet, using them to promote an attractive discount or a sale. If you manage to do this right, you can easily make your prospective customers curious enough to come to your store and find out what is it that you have got to offer. You can use the advertising flag inside your store for the purpose of promoting special offers, your website, new products, free-gift wrapping, a contest and other value-added offers. You can get yourself a huge advertising flag made in order to grab the attention of the passing car drivers. You can use them at special events like trade fairs, business conferences, etc., or display them at shopping malls or anywhere else, where you are likely to get several target audience. The benefits of an advertising flag are many. These benefits may be obvious to you or surprising, but they are reasons enough to consider the inclusion of banners in your advertising campaign. The best thing about advertising flags is that they are great at grabbing eyeballs. The property that results in this, is that flags wave constantly, drawing the attention of people. Once you manage to draw the attention, you actually stand a greater chance to convert the onlooker into your customer. You can get an advertising flag done for your business at really affordable rates, thus, making it a good choice for small businesses that cannot afford to invest huge amount of money in advertising, but need to draw the attention of the target audience. 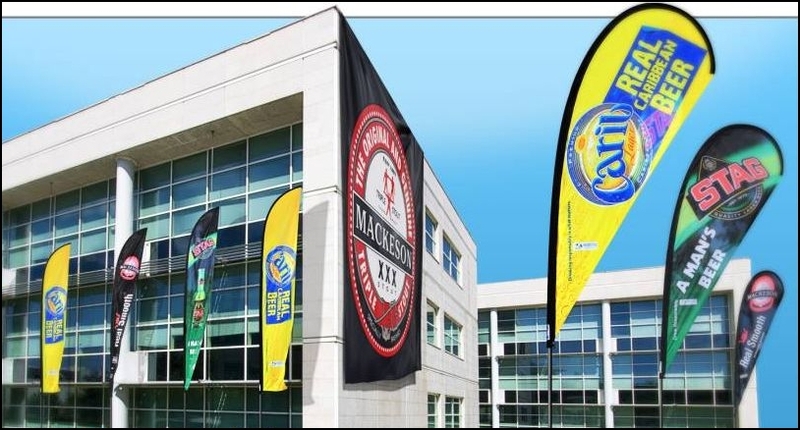 The advertising flag is indeed much more affordable as compared to other advertising mediums. It forms a very helpful medium for maximizing success in business without having to spend too much. Flags come in various shapes and sizes. They can be designed in whatever way you want and you can put in any kind of text you want. Designing it in your own way ensures that it clearly expresses your ideas. All you need to do is develop a good message, and a banner makes sure that it reaches the people you want to. So, using the advertising flag comes with several benefits, but not in return of a huge price. Make use of the medium and see your business flourish.